It’s a non-frills grill that focuses where it matters: on the cooking experience. Outdoor cuisine is a great way to bring family and friends together, and you don’t need an expensive piece of hardware to get great results. If all you need is the best grill for the money, while staying on a tight budget, the Beau Jardin Portable Charcoal Grill 18” is one of the best options out there. It’s a non-frills grill that focuses where it matters: on the cooking experience. Here’s our full review along with the reasons why this is the best grill for the money when you want something affordable yet capable. 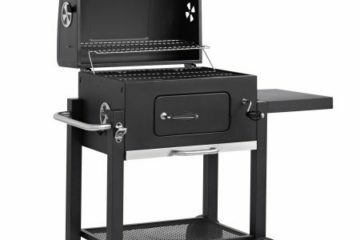 What makes this the best grill for the money in the sub $50 price range? It all comes down to the features. This grill gives you all the things that matter while omitting anything that would send the price up. Charcoal fueled for easy cooking anywhere. Lightweight steel and aluminum design. Simple to use and quick to clean. If you’re considering a grill in this price range, then you will need to keep your expectations reasonable. The best grill for the money won’t include advanced features, and this is true with the Beau Jardin 18” grill. Instead of going all out to make this the most versatile grill on the planet, the manufacturer has instead focused on a simple design with good construction and effortless cooking. 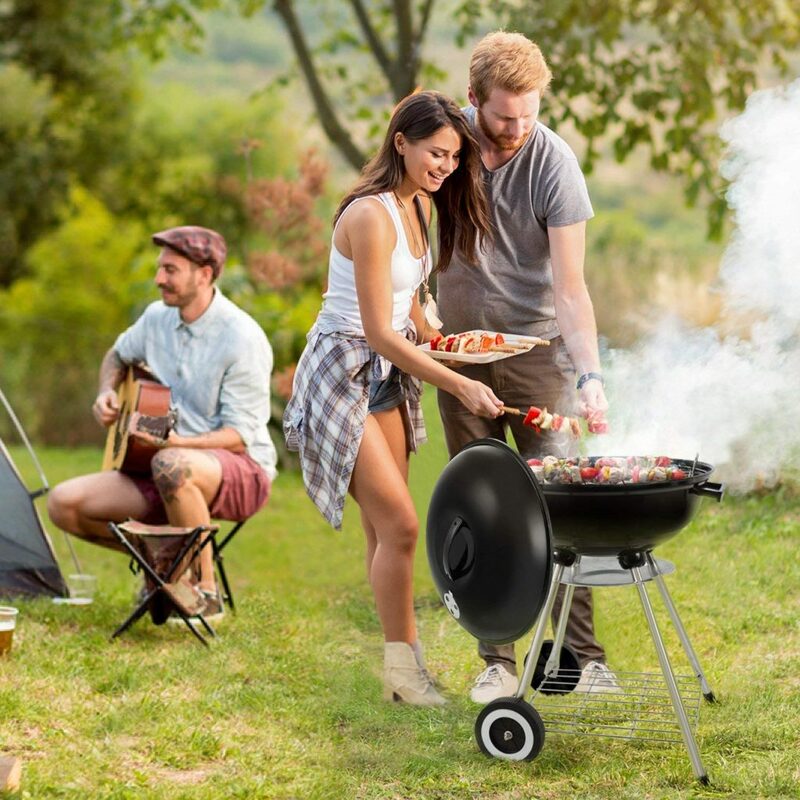 The grill is made from steel and aluminum, which keeps the grill lightweight and effortlessly portable. The design will be immediately familiar, as it takes on the style of many classic grills that have come before it. 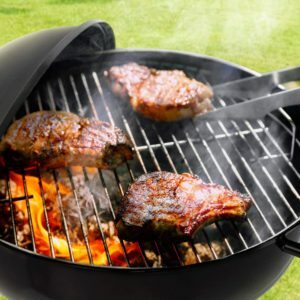 If you’re familiar with any basic Weber kettle grill, then you will recognize the design here. There are areas where the manufacturer has obviously chosen budget over premium materials. The aluminum ash catch system is a basic tray, and while it is functional, it’s nothing special to look at. The good news is that it does make cleanup easy, so you won’t have any complaints in this area. 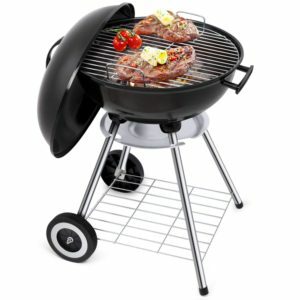 The legs of the grill are hollow metal, which again is not a negative when considering the price range. The parts are manufactured to a high degree of precision, so you won’t have any problems with the grill being unbalanced. At this price range, you might assume that this grill wouldn’t include wheels or even a significant undertray. Surprisingly, it does have two wheels for portability and a basic steel tray underneath. This can be used for basic storage while you are cooking on the grill. Assembly is simple and can be completed in a matter of minutes. 30 minutes to an hour would be the average assembly time, and you’ll only need basic hand tools and the instructions that come included in the packaging. 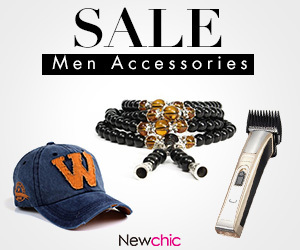 The grill is finished in black and polished metal which give it a basic and functional look. This is not a premium grill and doesn’t look as such, but it is still attractive enough and won’t look out of place on your patio, deck, or anywhere in your back yard. Size will not be a problem as the 18” diameter surface allows for family cooking as well as entertaining in small groups. The basic kettle design means that this grill comes with a hooded lid, which makes it possible to perform top-down cooking without any difficulty. You could fit a smaller chicken in here as well as some medium sized BBQ cuts. It’s perfect for steaks and burgers, vegetables, sausages and hot dogs, or pork chops and similar cuts of meat. The grill uses charcoal as a fuel source, so you won’t need to worry about gas cannisters when cooking. The design also means that there are fewer fragile parts, which helps to improve the durability. Kettle designs like this are timeless and can allow for standard charcoal cooking, or you could even throw in some pellets or wood chips for authentic smoke flavor. You’ll have manual control over the heat by using more or fewer coals, and this makes it quite versatile in terms of the different meat and other ingredients that can be cooked. This is not as versatile as a gas grill and is slightly less convenient, but charcoal makes sense for portability and may even be more affordable than gas, depending on where you live. 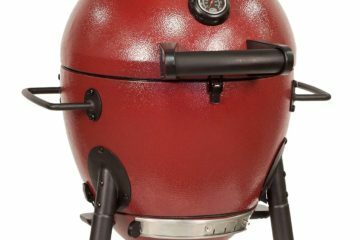 If you need the best grill for the money that can also do smoking in a pinch, then this is the one for you. If you are inexperienced with outdoor cooking and want something affordable to get started with, then this is again one of the best options on the market. Overall, cooking ability is impressive, especially considering the price. The round shape also makes this perfect for outdoor grilled pizza, so you’re not just limited to the classic grilled ingredients. Ease of use is on par with any other charcoal grill on the market. The basic design means that the coals go in straight under the grill, and you can control the heat by adding or removing the lid, changing the coal volume, or by using a bellows or simple fan to increase the burn rate. It’s not quite as simple as turning a gas valve control but it doesn’t really matter at this price point. If all you want is efficient and easy outdoor cooking, then this model will not leave you disappointed. Due to the design of the grill, cleanup is relatively easy. Any excess grease will be collected along with the ash, and most of the mess will end up directly in the firebox. 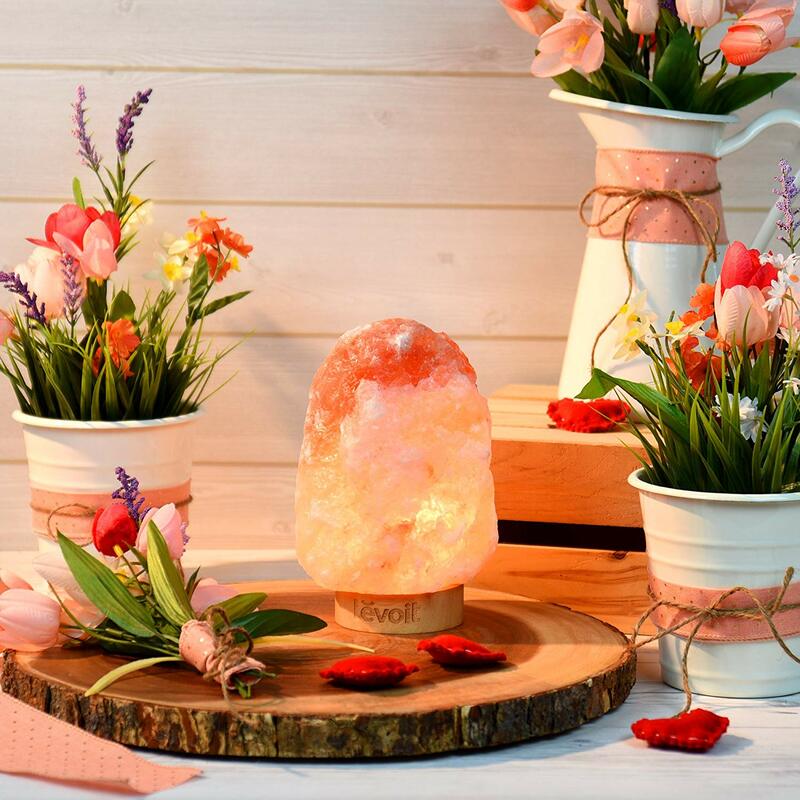 You can easily clean out the inside with a scraper and paper towels, and the grilling surface itself is removable and can be washed by hand with water and a sponge or cleaning brush. The ash catcher underneath the grill easily fills by rotating a small mechanism on the underside of the firebox. Even if you don’t use this, it’s easy to scoop everything out from the top for cleaning. One of the biggest selling points of this grill is that it is so lightweight it could be used for portable cooking. Whether you are going camping, heading out for a picnic, or need a grill to store in your RV, this one would be ideal. When disassembled it doesn’t take up a lot of space, and the thin and light materials make it weigh almost nothing. The total weight is 10.55 pounds, which is similar to other portable grills. The big benefit here is that you get a full-sized stand, so you won’t have to be crouched down or cooking on a small surface. There is plenty to like about this grill and only a few complaints. Decent cooking area thanks to an 18” diameter cooking grate. Easy cleanup with minimal grease leakage. Charcoal fuel allows you to cook anywhere. Suitable for both portability and home use. Good quality steel used throughout most of the construction. Includes wheels for easy relocation when using at home. Hooded lid is of a decent size and increases the cooking versatility. Can be used for light smoking (not suited to long sessions). Charcoal may not be the most convenient fuel for everyone. No side tray for preparation. The grill is rust resistant but would likely not be suitable for more than a few seasons. Is this the best grill for the money? In this price range, not a lot comes close to the Beau Jardin grill. It’s not a grill that would last for a lifetime, but at this price nobody will be complaining. If you want highly efficient charcoal cooking with a simple design and reasonable cooking surface, then this is the one for you. Being portable makes it even more convincing, particularly if you want a single grill for use both at home and on the road.